Krishnan's blog: Stuck in a virtual world ? Stuck in a virtual world ? Human race is believed to be the best creation of mother nature/God(whichever one connects to) simply because we have different emotions and we are an intellectual species. Our evolution has been remarkable over the ages. We have groomed ourselves from being uncouth to civilized corporeal or living beings. Most of our development can be attributed to the advancement in technology paved by globalization and liberalization. Today, information is available at our finger tips which is fast and accurate. With the innovation of internet, all information is available in our pockets. Facebook and whatsapp help us in connecting with the world in no time. Science and technology has become so advanced that everything is available at an eye's blink with very little investment. The next gen robotics and artificial intelligence will no doubt take our life to a new dimension. But, the real question is, are we getting too comfortable that we have ended up living in a fictitious world ? Has the focus shifted from advancement in science to advancement in technology although both are blood and skin.The reason why I ask one to ponder is that, today we are connected through facebook and whatsapp and other social networks which once did not exist, but one can not deny the fact that we were totally disconnected without them. Yes, due credit must go to technology for getting us connected across the globe but, has it made us too indolent that we have started pinging people though whatsapp and facebook messengers who jut sit across the table ?Too add to the woes, all our information is available online and is accessible by anyone leading to invasion of our privacy and security which otherwise would have been secluded. Yes, technology has helped man take a small step which in time has become a giant leap for man kind, but does anyone really know where this small step is leading us to? Technology was invented and developed to make progress in life easier and simpler. But because of our naivety to completely understand the marvel it has created, life for everyone is slowly changing into a Frankenstein movie wherein the creation is behind the creator’s life. Today in schools we have smart classes and now these apps and gadgets have taken over almost every part of our lives. Children these days have access to tabs and other advanced gadgets at very early stages of their lives and hence end up over using it without realizing the ill effects. A lot of the children these days do not go out to play instead end up playing in virtual world and thus end up becoming 'couch potatoes'. Lack of physical activities could be detrimental but the society as always shuns it. Tracing a child with an ipad or tab in its hand is not an unusual sight these days. Though development in technology is an achievement in itself, what happens when it begins to replace humans in your life? What to do when a 3-year-old depends on its tablet go sleep? as a child I wouldn't sleep until my mother would sing me a lullaby. My mother too was brought up this way. But what we see today is simply unbelievable. At times when a mother is too busy with her games such as Temple Run, Candy Crush and apps such as Whatsapp and Facebook, what can we expect from children? There are a lot of applications that cater to specific age groups and are a great hit too. Today everything that a mother could possibly teach a child is easily available on Internet. In fact many even say they do depend on the Internet for parenting tips. One can easily find information regarding the best applications for toddlers to keep them busy. What I don't understand is, What has happened to real toys and home learning? Another issue being the increase in cancer detected individuals , it has increased in huge numbers when compared to yester-years. The reason being the increased exposure to radiations from microwaves , cell phones and a whole host of other technology driven devices. Progression in technology has led to regression in life span with very few realizing it. In conclusion, inevitably, we are technologically advanced but we fail to acknowledge the fact that we have been morally and spiritually weakened as a result. We are heading towards cultural decadence ever since technology has become a part of our lives. It seems as if we have sunk into an ocean of nothingness. There is a compromise on human intellect because everything is available online and is up for grabs for all shades of people without people having to wear their own thinking caps. Technology has paved way for on-slaughter of human values and has tarnished human demeanor. Shackles need to be broken before one accepts the fate of virtual reality. 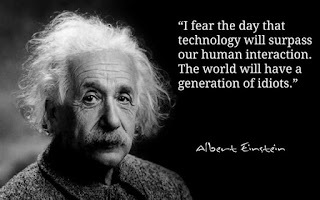 Lastly, as the Nobel Laureate had once quoted "I fear the day that technology will surpass our human interaction. The world will have generation of idiots"
Yes, but we can not deny the fact that gadgets have become part of us and to be without them is almost impossible.Try doing it and you will realize that you can not resist too long. Nice one Krish! Particularly the younger generation are the most affected due to the advancement and our dependency on technology. Children these days remember the release dates of next iPhone or next version of Android, but easily forget or miss their parent's / close one's b'days, unless reminded by FB!